Safe Prescribing is an e-learning course developed to support doctors throughout their Foundation training to become expert prescribers. The content reflects the core curriculum for principles of safe prescribing. It has been designed to raise awareness of aspects of prescribing which are prone to error and to give doctors basic information about how to write safe prescriptions. Successful completion of all sessions will generate a certificate of prescribing competency which can be added to the trainee’s portfolio. If you already have an account with e-LfH, then you can enrol on to the Safe Prescribing programme by logging in to the e-LfH Hub, selecting My Account > Enrolment and selecting the programme. You can then access the programme immediately in the My e-Learning section. 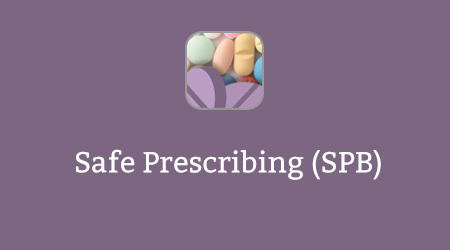 The Safe Prescribing programme is also available to NHS healthcare staff via the Electronic Staff Record (ESR). Accessing this e-Learning via ESR means that your completions will transfer with you throughout your NHS career.